I’ve posted this reminiscence of bygone Central New York television on another blog devoted to the Morrisville-Eaton Central School class of 1964 fiftieth reunion. I’m reposting it here for others who may have similar experiences growing up in various television markets. The Wonderful Magic Toyshop (“A smile is a frown turned upside down”) was on Syracuse WHEN television for 27 years. The program was as well produced as any network fare and, as a recent book on Syracuse Television noted, we viewers didn’t know Merrily and Eddie Flum Num weren’t from Hollywood. 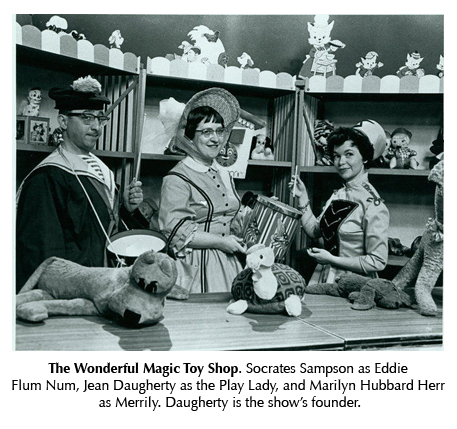 In 1996, Jean Daugherty — the toyshop’s Play Lady — recorded the history of the show in Syracuse University’s Courier. The Class of 1964 was the vanguard of the post World War II Baby Boom, and our coming of age coincided with the rise of television. For our parents, the tube was a miraculous phenomenon and buying a TV set was a major goal for most households. In 1950, 9 percent of U.S. households owned a TV; by 1964, 92.3 percent of homes had at least one TV. Local Syracuse television contributed importantly to our entertainment and education. At least two MECS students attended live broadcasts of Toyshop. When we were in junior high, Don Miller took his English classes to WSYR to see Jim DeLine’s show, which pioneered the talk-entertainment format. In 1964, late night movies on channel 9 were hosted by Baron Daemon, a scenery-chewing extrovert whose vampirish antics attracted a small but devoted following among MECS students. Even in the days before HDTV, televisions provided us with a virtual reality that seemed real enough to us. The Mercury rocket launches, the Mantle-Maris race to match Babe Ruth’s home run record, the star-crossed Ernie Davis’s heroics on the S.U. grid iron, JFK’s speeches and assassination, all were events we will never forget.